Quad #16 Entry Fee: $12 if early, $15 at site, (members $5 off, FM and above FREE). ($$ FREE Membership): One year of FREE Chess Castle membership to the winner of the most quads at the end of the year (split on a tie). Onsite Registration: 9:30-9:50 (phone or text 763-232-9944). Rounds: 10:00-1:30-ASAP. Byes: None. Other: This is an inexpensive event for fun and competition, usually done by 6 or 7. Directed by Nate Hoover. House player welcomed. Round times are estimates. There is a 1/2 hour lunch after round 1 and a 5-10 minute break after round 2. If you register early, you must still check-in by 9:55, or you may not get paired. Lower section is often rated youths grades 4-8. All proceeds go to the Chess Castle. See Quad #15. Entry Fee: $50 to Chess Castle members if registered by 10/7, $60 to non-members, $10 more after that date. $10 play up fee for players under 1800 in this section. Prizes: 1st $300, 2nd $200, 3rd $100, U2300 $150, U2100 $150, trophy tor biggest upset. Entry Fee: is $40 to Chess Castle members if registered by 10/7, $50 to non-members, $10 more after that date. Prizes: 1st $200, 2nd $125, 3rd $75, U1500 $100, U1300 $100, trophy for top U1100, U900. Onsite Registration: 9-9:45 am. Rounds: Sat. 10-2:30-7:30, Sun. 10-3. One requested half-point bye allowed, any round, must request before start of round 2. Additional Details: www.chessweekend.com. Info: Email Glenn Panner at glenn@chessweekend.com. Quad #10 Entry Fee: $12 if early, $15 at site, (members $5 off, FM and above FREE). ($$ FREE Membership): One year of FREE Chess Castle membership to the winner of the most quads at the end of the year (split on a tie). Onsite Registration: 9:30-9:50 (phone or text 763-232-9944). Rounds: 10:00-1:30-ASAP. Byes: None. Other: This is an inexpensive event for fun and competition, usually done by 6 or 7. Directed by Nate Hoover. House players welcome. Round times are estimates. There is a 1/2 hour lunch after round 1 and a 5-10 minute break after round 2. If you register early, you must still check-in by 9:55, or you may not get paired. Lower section is often rated youths grades 4-8. All proceeds go to the Chess Castle. Registered: 8 players, see Wallchart. Always looking for a new venue to play chess, so I'll be joining the Duluth guys and Jackson Wahl in Eau Claire, Wisconsin this weekend. Only $45 for six slow games spread out over three days (Friday through Sunday). The time control of 45 moves in two hours, and then another hour for the rest of the game, takes me back to my youth, as that was the time control for the Minnesota Open many years ago. Find the details at www.wischess.org. Three games, played at a time control of game in an hour + 30 second increment. (Note this means you are required to maintain a score sheet for the entire game.) The field is divided into groups of four by rating, and each quad plays a round robin. Register from 9 to 9:50 AM (phone or text 763.232.9944). Entry fee is $10 early, $13 at site, with $5 off for club members, free for FIDE masters and above, others $12. Round times are 10, 1:30, and the last round starting ASAP. This is an inexpensive event for fun and competition usually done by 6 or 7. The winner of the most quads at the end of the year wins a Chess Castle membership (value $120, split on a tie). Directed by Nate Hoover. State (MSCA) and national (USCF) memberships required. New event: Rated youth section grades 4-9 if 4 or more players, (G/45; +30), likely done by 4 or 4:30. There is good interest in the rated youth section with 3 youths already registered. Go to my website and select Early Bird from the drop down list. If you register early, you must still check in by 9:55 AM, or you may not get paired. Either call, text, or be there (763-232-9944). The club is not open on Sunday. The young man is at the Castle all weekend, from where he is playing in the 2015 ChessKid National Online Invitational Championship. He is up against other tough, young chesspunks from around the country. He drew his game last night (Friday), and has a pairing of games today and tomorrow. You can follow him online at chess.com, or stop by the Castle and witness the moves in person. The biggest city tournament for the next few months will be the Second Golden Gopher Open, (on bottom right of linked page) being played on the last weekend of May at the Crown Plaza in Plymouth. They're offering three sections in the main event, and three one-day side events. Grandmaster Maurico Flores will be there again, giving a lecture, and giving you a chance to get his autograph on a copy of his recently released book on pawn structures. For yesterday's 50th Annual Minnesota Scholastic Championship. Congratulations to all the winners and thanks to all who competed, and their coaches. Note that the four way for first place in the K-12 section will be resolved by a double round-robin playoff at the Chess Castle on Sunday, April 18th. The site for this weekend's Scholastic Championship is the best one I have ever seen in my ten plus years of directing this tournament Be forewarned that the staff and I will be very insistent on players behaving themselves; picking up their trash, and treating our space gently. We definitely want to leave and good impression, so as to return next year. St. Catherine University is in the west side of St Paul, south of I-94. You can exit the freeway at Cretin or Snelling, and head for Fairview Avenue which is in between the two. Take Fairview south, cross Randolph, and the campus is on your right. Take second entrance on your right, in the middle of the block, turning right into entrance number four. The O'Shaughnessy parking lot is on the left, but there is a closer lot to our site that should be big enough for our guys. So go pass that lot, and swing left around the water tower. The road goes past a modernistic clock tower on the right. Behind that is a red brick building, and we are in the tan brick building next to it, still on your right. There is a large entrance, back off the road a little bit, capped by a triangle with vent slots in it.The good parking is at the end of road. We are up on the third floor, above the library and the cafeteria. In the above map, we are in the yellow building, at number 30. CONGRATULATIONS TO MINNESOTA'S NEWEST MASTER; ZACHARY ADAMS. First, a reminder of the big Bloomington Open coming up the weekend after next. Five games, two sections (open and u1800), and two or three day schedules. Register online at Sisira’s site by November 3rd to save $10 on the entry fee. You will also find the tournament details and see a list of players already registered. The field is headed by the strongest players in the State: Sean Nagle, John Bartholomew, Andrew Tang, and three other masters. Curt Brasket is being honored in his home town of Tracy, Minnesota, next month. Every year, their High School selects an accomplished native son to be named Alumni of the Year. This year the honor goes to the 16 times Minnesota State Chess Championship. Nice to hear Curt is remembered, and nice to hear from one of our all-time favorite chess managers, Rita Brasket. Jack Mangan and Brian Ribnik are looking to revive the High School Chess League, and are looking for teams interested in playing one game a week in the upcoming winter. Call Jack at 612.432.0704 if you are interested. This is your official notice of a change in policy for the Chess Castle concerning people who are late for the start of their games. We have previously applied the official one hour rule (13D in the USCF rule book), but are now are changing that to a half an hour for all our slower events. We do allow the tournament directors discretion in this matter. If for example, you are caught in terrible traffic jam, and call us ahead of time, or have other good reasons, we can give you extra time. Don't want you crashing trying to make the cutoff! Norm Myrin has been running the Thursday Knighter tournament for decades, and draws a fairly good crowd. Each month is another tournament, with one game a night, with four or five rounds depending on the number of Thursdays. A lot of the players are regulars; players who like the slow time control. Several of these players have put together a promotion called the M-V-H Challenge. It is restricted to those rated 1800 and under, who are able to make a perfect score any month (i.e. no byes or draws). The prize starts out at $60, and increases by $20 after each month with no winner. The September edition starts this Thursday. Just be at the Castle before seven with $20 ($15 for club members). We met this young man from Chile at the end of last June, when he played at the Golden Gopher Open, at the Crown Plaza in Plymouth. His playing in the tournament, and the attached simul, helped make that tournament a success. Since then, he was in Tromso, Norway, playing board two for Chile at the Chess Olympiad. Now he is back here for his graduate work, and has signed up to for this weekend's Noel Skelton Open, at the same Crown Plaza. With these two gracious young grandmasters, Welsey So and Mauricio Flores, along with our three home-grown IMs, this will be easily the strongest tournament in Minnesota in many years. ALONG WITH WESLEY SO, this tournament will feature, for the first time, three home-grown Minnesota International Masters. Thats Sean Nagle, John Bartholomew, and Andrew Tang. Like last year, there will be a simul at the Castle on Friday night, the 29th, featuring Grandmaster So. The price has gone up to $35 because this guy is now the 12th highest rated player in the world, and cannot be expected to thrash you for peanuts! Dr Sisira has already put together two sections of six players for this FIDE round robin this coming weekend. We know of several more players that were interested in that event. If we can find a few more, a third section is possible. Let us know at sisira@amarasinghe.com if that describes you. The other option is to play in the USCF rated event listed below. Along with the two foreign headliners, and our current state championship, we now add Prashantha Amarasinghe, Zach Tverstol, Jackson Wahl, Ahmet Shapiro and Dane Zagar. There are not a huge number of entrants yet, which makes this an especially strong event, ideal for anyone looking for some hard battles. If you can only play Sunday, come for the simul at one. The charge for the GM is only $15, and the WIM only $10. PLAY QUICK CHESS THIS SUNDAY! A word of encouragement for you to try something new, this coming Sunday. It is inexpensive and fun, and there are no scoresheets to haunt you until the day you die. This is NOT blitz chess, and there will be time for a few big thinks. A chance to get in touch with your intuition, and forgo all of the endless calculations. Play like man and not a machine! With ten games, and no effect on your regular rating, it's a good chance to try out a new opening. The field is lead by Andrey Chernov and Andrew Titus. You can still get in today (Saturday) with a bye at one, or two byes at 3:45. As is the case with any of our events, if you show up and we have an odd number, you can get a game or more as a houseman. 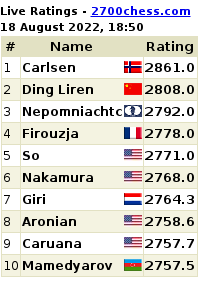 Tomorrow, the Gashimov Memorial will feature Nakamura vs Carlsen. Our boy only needs a half a point to join the leaders. Our own John Bartholomew will be leading Dr. Iwu, Kevin Wasiluk and Jason Drake down to northern Iowa to do battle with Chess Life cover boy, Awonder Liang. Good luck with that. For those not fortunate to be joining them, there will be a local two day event at the Castle.